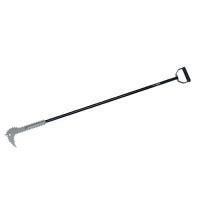 511 Tactical 503359991SZ Gryphon BreakN'Rake Extended Entry Tool (50335) FREE SHIPPING! Blocked doors will not prevent entry with the Gryphon BreakN'Rake Extended Entry Tool from 5.11 Tactical. Designed specifically for window breaches, the extended BreakN'Rake offers a 70-inch handle for reaching high windows and glass sealed entry ways. The carbonized steel head easily shatters ultra-tough privacy and hurricane glass up to an inch thick for reliable entry into the most secure portals. An extended hardened hydraulic steel rake clears lethal glass shards, insuring safe window entry. The D-handle employs a rubberized coating for a secure grip when striking, slashing or sawing. The tool is made to work in conjunction with other tools in the 5.11 breaching system. ©2002-2019 CopsPlus.com: 511 Tactical 503359991SZ Gryphon BreakN'Rake Extended Entry Tool (50335) FREE SHIPPING!